I know that you are a Republican who wants to become the next President of the United States of America. I also know that you are stirring up conflicts with many different people, from your rivals in the presidential election to the mocking of ordinary people like the journalist who has congenital joint condition that affects his ability to control his limbs. These actions doesn’t make you a very good person, moreover, a very good presidential candidate. Recently, you also brought back your proposal of banning Muslims from entering the United States, saying that it was temporary and had its exceptions. You also spent two million dollars on ads, that depicted San Bernardino shooters, who were Muslims, and body bags and lots of explosions. Honestly speaking, you trying to execute this ban is not going to help you in the long run of being victorious in the election and isn’t going to give you a good image for most Americans. Since America is viewed as the land of the free and the brave the ban is just wrong and unlawful. Republicans and Democrats alike reprimanded the ban saying it is non-American and counterproductive. So, not only are you, Mister Trump, going against what we Americans believe in, but what our country was founded upon. I believe that you should go back to social studies class or even retake the constitution test so you can understand how America came to be and why we regard and take great pride in our freedom ,rights, and diversity. I’m not kidding. I’m being serious. I mean, most countries don’t have these values that we do. People dream about coming to America because they could be themselves without following too harsh or strict rules. So, why should we ban them? They just want to be a real human being instead of a deprived specimen. In December 2015, the Washington Post and ABC News made a poll about you and who actually supports your Muslim ban or not. Six out of ten Americans thought that the ban was the wrong thing to do. See, most of America is against this ludicrous act. You, sir, should just give up. It’s not worth the Americans’ money and time to do this. Moreover, you have to remember that anyone who is coming into the US is going to be thoroughly checked to see if they are terrorists/dangerous people. Not only am I very vexed about this ban you want to initiate, but deep down I am really terrified. I am terrified because if the ban did go into place, people would see me differently. They wouldn’t see me as an American anymore, but a blood-thirsty Muslim who cannot be trusted anymore. It makes me feel isolated. I don’t want my non-Muslim friends to stop being my friend anymore just because I’m Muslim. I’m not like ISIS. I don’t want to hurt anyone. I just want to be friends with everyone and make really good memories with everyone. Is that so hard to ask? 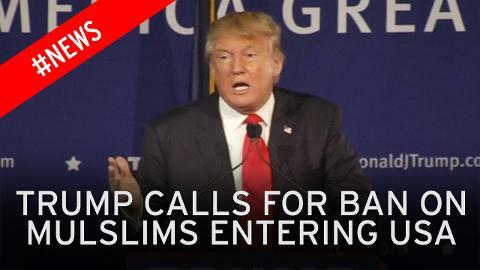 And Muslims who want to enter the US, it’s also hard for them. They just want to start a new life, and by doing that, they had to leave their family members behind and their home, that is probably a battlefield now because of their country’s corrupt government. This is their home, and it’s mine too. I hope you take some time out of your life and read my letter. You need to hear what the people have to say about this matter, even from someone like me who isn’t eligible to vote yet.